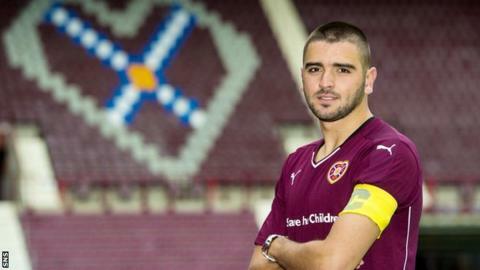 Hearts defender Alim Ozturk says he is "honoured" to be named the club's new captain by head coach Robbie Neilson. The Turkish centre half takes the armband from Danny Wilson following the defender's move to Rangers. "I'm looking forward to passing on my experience and knowledge," Ozturk told Hearts TV. "I love to help the young players. Robbie spoke to me about responsibility and stuff like that. It's a really proud moment for me." Ozturk aims to impress in the top flight having helped Hearts earn promotion from the Championship following his move last summer. "I'm honoured to be captain of a club like Hearts, a really big club," the former Trabzonspor defender said. "I'm really proud. "Of course, it is the proudest moment of my career. There have been a few good moments but this one is a really, really big thing for me. "I've now got more responsibility, but I will do everything to represent Hearts as good as possible."